Use SignalFx to monitor Azure Logic Apps via Microsoft Azure. Azure Logic App: Shows metrics of a Logic App. Azure Logic Apps: Shows metrics of all Logic Apps being monitored. Billable Executions - Number of billable actions/triggers by app. Runs Completed - Number of workflow runs that have completed for the app. Actions Completed - Number of actions that completed for the app. Runs Succeeded / Failed / Throttled - Number of workflow runs that succeeded/failed/got throttled for the app. Actions Succeeded / Failed / Throttled - Number of actions that succeeded/failed/got throttled for the app. Triggers Succeeded / Failed / Throttled - Number of triggers that succeeded/failed/got throttled for the app. Run Latency (s) - Run latency for the app. Action Latency (s) - Action latency for the app. Runs Succeeded - Aggregated number of workflow runs that succeed. Successful Run Latency (s) - Average latency of succeeded workflow runs. Runs Failed - Aggregated number of workflow runs that failed. Runs Throttled - Aggregated number of workflow runs that throttled. Runs Completed - Aggregated number of workflow runs that completed. Total Billable Executions - Aggregated number of workflow executions that are billed. 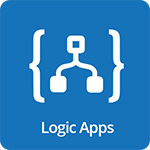 For more information about the metrics emitted by Azure Logic Apps, visit here.